지난 3일 경기도태권도협회 3층 회의실에서 경기도태권도협회(회장 박윤국)와 카바르디노발카리아(KABARDINO-BALKARIA)태권도협회(회장 쇼카르브 아즈레탈리)가 양 협회 태권도 발전을 위한 업무협약을 체결했다. On that day, in the ceremony of the agreement,President Park Yun Guk, Standing Vice President Kim Gyeong Deok, Vice PresidentOh Mun Seob, Vice President Oh Myeong Hwan, Vice President Jeong Jae Seol,Executive Director Yim Jong Nam, General Secretary Kwon Tae Gu (Gyeong TaeFoundation), and General Secretary Kim Pyeong (Federation) and PresidentSyokarv Arzretalli (Balkar Taekwondo Association), and Chairman of the NationalAssembly Chechenov Anuare with two more interested people participated. 이날 협약식에는 박윤국 회장, 김경덕 상임부회장을 비롯해 오문섭 부회장, 오명환 부회장, 정재설 부회장, 임종남 전무이사, 권태구 경태재단 사무총장, 김평 연합회 사무국장 등 8명과 발카리아협회 쇼카르브 아즈레탈리 회장, 국회의장 체체노브 아누아르 등 4명의 관계자들이 참석해 협약이 진행되었다. 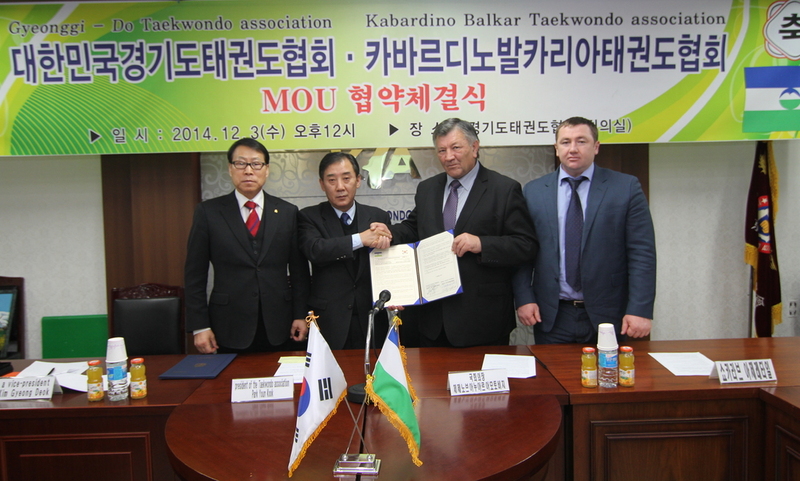 After Kabardino Balkar Taekowndo Associationrequested to cooperate with the best association in Korea where Taekwondo hasoriginated, it was promised to conclude a task agreement. The agreement focuseson the distribution of skills and the partnership of administration suitablefor the local state of about 50 Taekwondo academies operated in Balkaron), and Chairman of the NationalAssembly Chechenov Anuare with two more interested people participated. 태권도 종주국인 대한민국에도 최고의 협회와 협력하기 위해 카바르디노발카리아협회 측에서 요청해 추진한 이번 업무협약은, 발카리아 내 운영되고 있는 약 50여개 태권도장의 현지 실정에 맞춘 기술보급과 행정제휴 등의 내용으로 협약이 이루어졌다. Through this MOU, both associations promised toactively participate in each other’s competitions and exchange Taekwondo andphysical education/culture/education/training projects for the mutualdevelopment administration suitablefor the local state of about 50 Taekwondo academies operated in Balkaron), and Chairman of the NationalAssembly Chechenov Anuare with two more interested people participated. 이번 MOU를 통해 양 협회는 서로 주최·주관하는 대회에 적극적으로 참여하는 것과 태권도 및 체육·문화·교육·연수 사업 등에 교류를 활성화하여 서로 발전을 도모하기로 논의를 마쳤다. 박윤국 회장은 이날 환영사를 통해 “태권도에 대한 애정과 큰 관심을 가지고 태권도 보급?발전에 앞장서 주셔서 감사하다. 양협회간 기술 제휴로 우호증진의 계기가 되었으면 좋겠다”고 말하고 “태권도와 더불어 더욱 광범위한 교류가 이뤄지기를 바란다”는 뜻을 밝혔다. 이에 체체노브 아누아르 국회의장은 “내년 3월에 세계대회가 발카리아공화국에서 개최 된다. 발카리아는 250고지부터 2,500고지까지 전지훈련 장소로서 좋은 환경을 보유하고 있어 경기도협회 선수들에게 편의를 제공 할 수 있는 여건이 된다”면서 적극 적인 교류를 요청 하였다. 한편, 1991년 구소련의 해체와 함께 러시아연방의 자치공화국으로 주권을 선포한 나라인 카바르디노 발카리아는 천혜의 자연관광과 풍부한 지하자원, 화학산업과 석유산업 등의 제조업이 발전한 러시아 남부 중앙아시아 카프카스 산맥 북동쪽에 있는 나라로, 앞으로 양협회간 태권도 뿐 아니라 다방면의 교류가 적극적으로 진행될 것으로 전망된다.